Arizona Town Hall educates, engages, connects and empowers people to resolve important issues through consensus, not division, using a process based on respectful dialogue that values diverse perspectives, builds relationships and fosters leadership development. Play the video below to listen to a podcast hosted by Stu Turgel with Arizona Town Hall President Tara Jackson talking about what Arizona Town Hall is and does. Arizona Town Hall is governed by a board of directors, representing a composite of leadership from Arizona's 15 counties and from diverse occupations and interests. Board members are elected to two-year staggered terms. 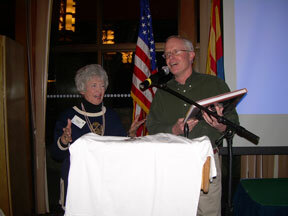 Shirley Agnos (left) receives a special photo album in recognition of her dedication to the Arizona Town Hall. Read this article in the Arizona Republic from member and frequent Town Hall participant Talonya Adams: "Arizona Town Hall builds unity, voice and purpose." - Denise Meridith, President & CEO, Denise Meridith Consultants Inc.